We have left a message with the Department of Public Utilities to hopefully secure the sinkhole. 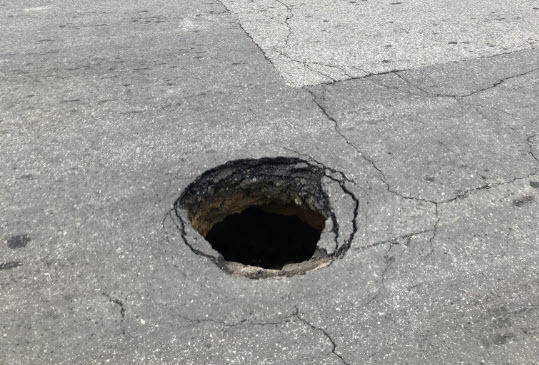 This will take some time to repair so please be mindful walking or driving through this area. I hope George Mason Elementary School Bus drivers are aware. There’s also one on on the 1000 block of 26th street that’s been there for months and no one will come fix it! Also be careful around the Chimborazo Blvd and P street intersection. Avoid if you can. Here’s what my wife did to get the city to fix the hole in front of our house on M St.
Richmond is such a great city. Good place to hide the drugs, city will never find it. If lean in close, you can hear distant voices speaking in Mandarin! 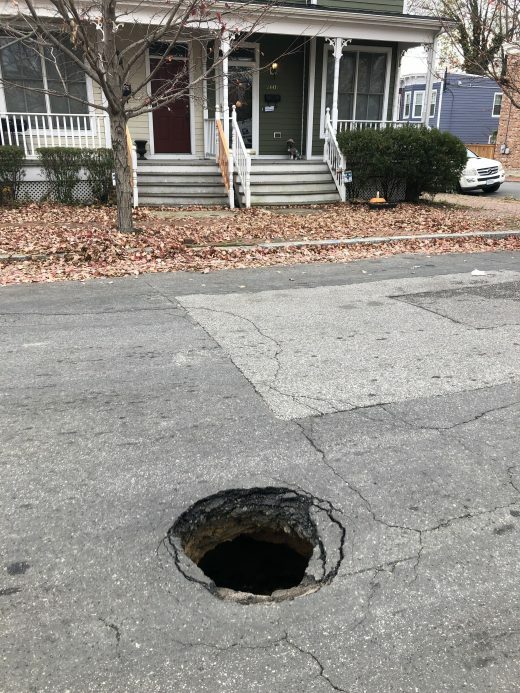 My husband has repeatedly reported a similar sinkhole in 400/500(?) block of N 25th St. Uh, why can’t I see the photo Thomas Blanton posted? Either I’m taotly blind or just have my expectations based on the pre-2014 chpn. @ Mary Anne, the comment Thomas Blanton posted is imported from a Facebook comment. It doesn’t import photos. In general, we can’t have photos in the comment section on the website, but on Facebook, the comment section is built for photos to be used. We are happy to hear any feedback about your expectations for CHPN and do our best to meet the needs of the community. If you can email us at chpnrva@gmail.com to let us know what you hope for, we can consider your feedback while building the new website. Thanks! hole has been fixed and O street between 25th and 26th is being paved!